"The Tungsten Jigstone has all of the charateristics of an effective stonefly pattern. 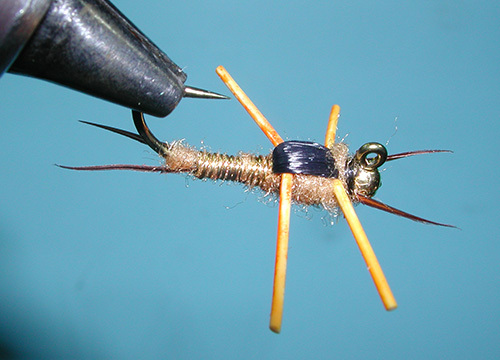 It is heavy, easy to tie, a little flashy, durable, and contains the strike inducing rubberlegs, The Tungsten jigstone separates itself from other stone imitations at it's skeleton. It is tied on a TMC 403blj jig hook (#8,10,12) with a tungsten, slotted, faceted bead which saves the angler from losing countless flies amonst the bottom of snaggy pocket water (hook point rides inverted. The jigstone lessens the amount of lost flies and increases valuable fishing time." "I fish the Jigstone individually with no trailer. 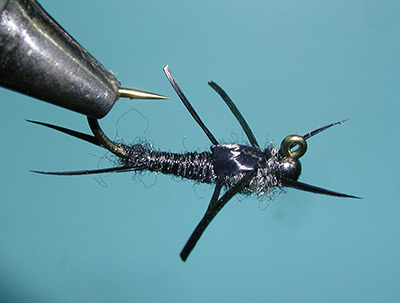 Jig hooks don’t always cooperate with other nymphs within the same rigging (tangles occur frequently). Single nymph rigs offer less rigging, easier casting, and less opportunities for tangles. Additional nymphs on the leader are also often the culprit for fish being lost during the battle due to exposed hooks (the hook not in the trout’s mouth) snagging structure during the fight."